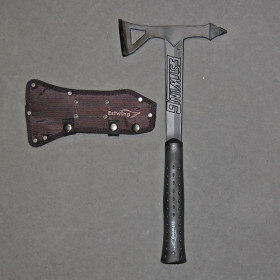 Black Eagle Tomahawk » Protective Solutions, Inc. Rugged and reliable, this tactical tool is made for years of service. Made from forged one-piece American steel, it is designed to perform under all conditions. It is perfectly balanced and weighted with a shock reduction grip that reduces vibration by 70%. Perfect for breaching, extrications, searches, self-defense and more. Includes black nylon sheath.